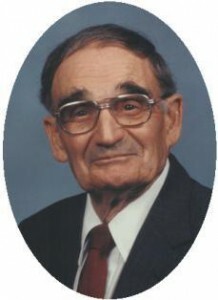 Harold Spake, 94, died at his Ellen’s Home residence in Port Washington Friday, September 9, 2005. He was born July 21, 1911 in Green City, Missouri to James and Elfie Riddle Spake. He grew up in Missouri and met Lucille Walker. They were married March 3, 1938 in Missouri. Together they farmed in Missouri until 1954 when they move to Borger, Texas. He worked as a television repairman and in 1958 they moved to Phoenix, Arizona. He began working for General Motors Honeywell doing electronic assembly, retiring in 1976. During his life, Harold was a carpenter and construction worker. He was active with his churches and their Vacation Bible Schools, building playgrounds for them. When he was 76 he built his own garage, by himself and enjoyed making walking sticks. On December 21, 1987 his wife, Lucille, preceded him in death. In 2002 he moved to Port Washington to be near his daughter. Harold is survived by his daughters Shela (Al Smith) Tolby of Shenandoah, Virginia and Gayla (Nick) Ploussard of Grafton, Wisconsin. He was the proud grandfather of Travis Tolby and Nicole Ploussard. Further survived by sisters Gertrude (Cliff) Baxter of Phoenix, Arizona and Agnes Frazier of Green City, Missouri, nieces, nephews, other relatives and friends. Preceded in death by his wife, a brother and a sister. Family will receive friends from 4 – 6 pm Monday, September 12, 2005 at the funeral home. Interment in Green Acres Cemetery, Scottsdale, Arizona.